Performers include: Krysten Ritter, David Tennant, Mike Colter, Rachel Taylor, Carrie-Anne Moss, Eka Darville, Erin Moriarty, and Wil Travel. Born Jessica Campbell, she and her family were in a lethal car crash with a military convoy transporting radioactive substances, which have imparted the girl with super strength. As her family’s sole survivor of the wreck, Jessica is adopted by the Jones family and takes their surname. 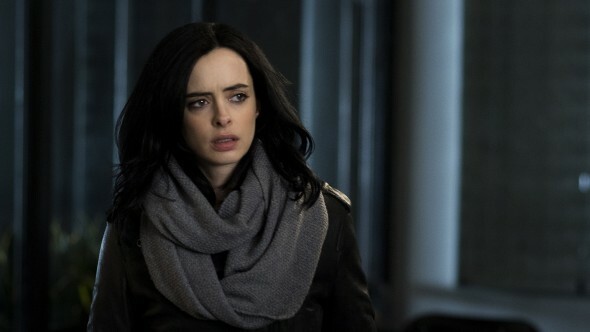 Rebounding from atrocities she endured as Superhero Jewel (as well as a brief stint as Knightress), Jessica Jones (Krysten Ritter) opens her own New York City private detective agency — Alias Investigations. As she tries to start her life over, the still-traumatized, hard-edged, hard-drinking, profane Jones is drawn to cases involving people with superpowers. During an investigation, Jones meets the mysterious Luke Cage (Mike Colter), who is possessed of super strength and invulnerable skin. With secrets in his past, Cage keeps his own counsel. He will have a tremendous impact on Jones’ life. A former child star, radio host Trish “Patsy” Walker (Rachel Taylor) is Jones’ best friend and emotional mainstay. Their relationship runs deep and is not without conflict, but is important to both women. Powerful attorney Teri Hogarth (Carrie-Anne Moss), a lesbian, retains Jones to work cases. Their fledgling alliance could prove beneficial to Jones, as long as Jones does not fracture it with her blunt, hostile tendencies. When a shadowy figure — Zebediah Kilgrave a.k.a. The Purple Man (David Tennant) — emerges from her past, it sends Jones reeling. As Jones’ chief nemesis and worst nightmare, this villain delights in using his superpower of manipulation to torture others. Malcolm (Eka Danville) is Jones’ neighbor, who is battling addiction. The two grow to fill a sibling’s role in each other’s lives. NYU student-athlete Hope (Erin Moriarty) arrives at Alias Investigations as Jones’ client. Having Kilgrave in common, the two women bond. NYPD detective Will Simpson (Wil Travel) is a by-the-book cop, who cannot perceive all the shades of grey on Jones’ muddied palette. What do you think? Do you like Marvel’s Jessica Jones TV show? Do you think it should have been cancelled or renewed for a fourth season? Renew it. Good acting for once! Please renew this series. Absolutely fantastic! Kristen nailed the acting on Jessica Jones. version and the comic book version is stout looking . I like K Ritter but maybe she should hit the weights a little . Other than that so far so good .